“Update on Winter (Monday morning): Very sad news to report this AM. Winter’s internal injuries and damage to her pelvis were so severe that despite all efforts, we could not save her. Surrounded by humans who loved her, she crossed the rainbow bridge peacefully. Her time with us was very brief but she left us knowing love and family and will never feel pain again. 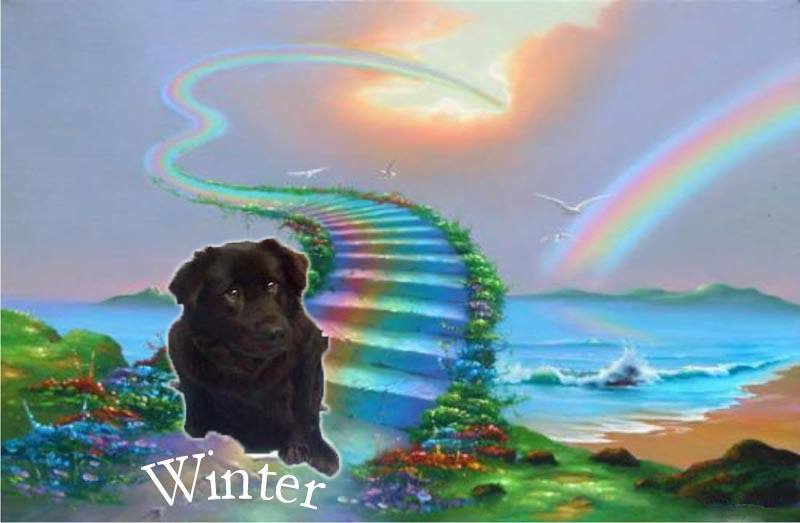 RIP Winter… sad day but thank God she found us and thank you all for allowing us to try to help animals like Winter. RESCUED! This poor girl came to AFA after it appears she was surviving all on her own (and in quite some pain) for quite some time From what our medical team can piece together, we know she was hit by a car. Pelvis and legs are bad. Our veterinarian repaired one leg and her jaw. 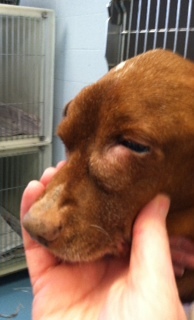 She also had some teeth removed as well as an impaction. She also has the remnants of two BB pellets in her one good leg. All the pain she was in, she tried to give kisses after coming out of anesthesia, as if to thank God she was finally saved. Our fantastic medical team took great care of her but she will undergo surgery again to repair her pelvis (thank you Lauren’s Wing for helping to cover the costs of her specialty surgery www.laurenswing.org). Lauren’s Wing The Fund For Animal Care is grateful to have played a role in helping this poor dog. Thank you AFA for giving Winter comfort and love on her final days on this side. It’s an honor to be partnered with such a great shelter. Season’s Greetings! We would like to thank all of those who donated and liked us on our facebook page. 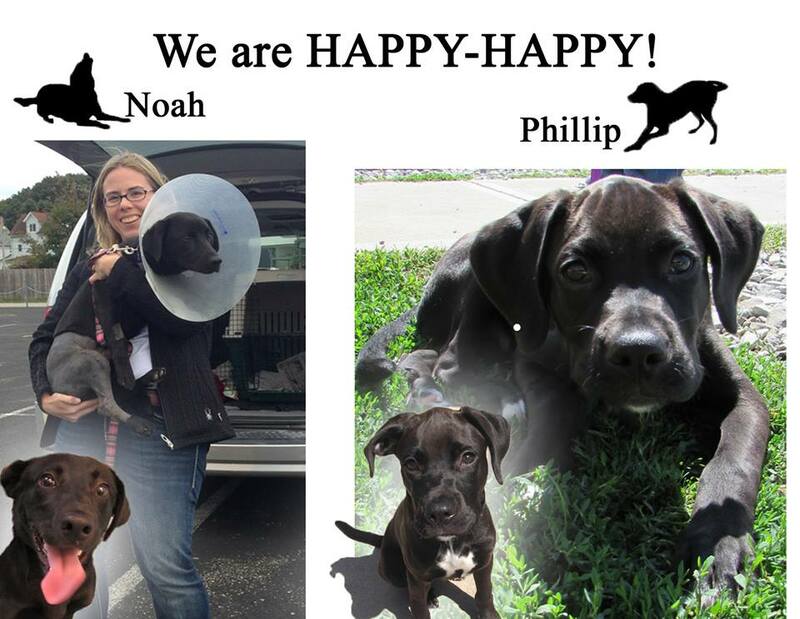 Your generosity and support made these happy endings possible! Lauren’s Wing – The Fund for Animal Care has a tree decorated for the holiday season. Come visit us for the “Parade of Trees” at the Ramada Inn, in Greensburg! Although it is hard to look at my before and after pics, please know that I am feeling much better after my emergency surgery to remove my terribly infected eye. I am a 10 week-old stray. Life is much better now that I am pain free and getting such great care from the wonderful staff at Action for Animals. Thank you to everyone who supports Lauren’s Wing – the Fund for Animal Care- you helped to make my surgery and recovery possible! Lauren’s Wing – The Fund for Animal Care wishes all a Happy Thanksgiving. We are indeed grateful for your support and generosity. Wishing you all a wonderful day filled with love, blessings, family and friends! 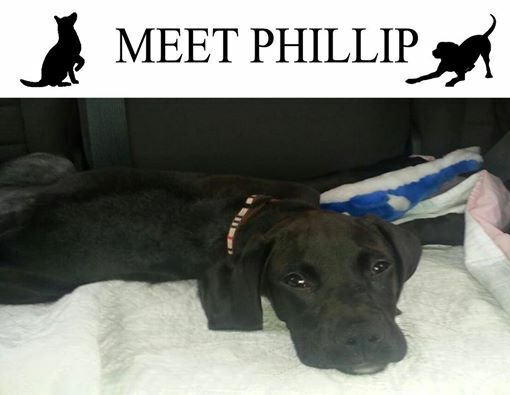 Wonderful news: Phillip was adopted this past weekend! He will be in great canine company in his new home- another Action for Animal Alum lives there and is sure to become his BFF! Best wishes to his new family for opening their hearts and home once again! 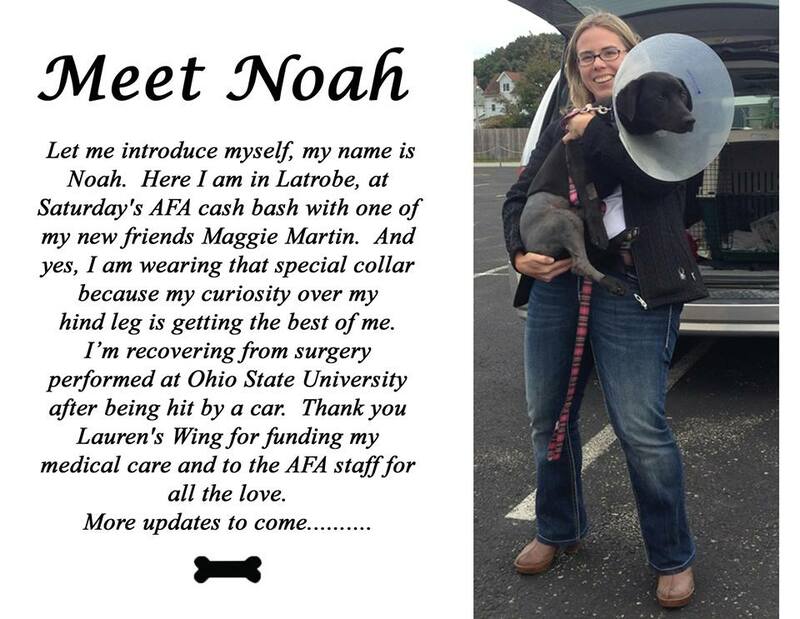 A few short days later Noah also found his forever home!!! Best of luck to his new family. Thank you for giving this special guy a second chance for a new and happier life! Lauren’s Wing – The Fund for Animal Care wishes to express our utmost gratitude for the generous donation from Carpenter Latrobe Specialty Metals – Carpenter Cares Committee! It is wonderful to know that corporations in our community care and wish to give back. Donations like the one from Carpenter Latrobe Specialty Metals – Carpenter Cares Committee are proof that large companies can have large hearts- and ours at Lauren’s Wing are indeed grateful that they have considered our endeavor worthy of support. 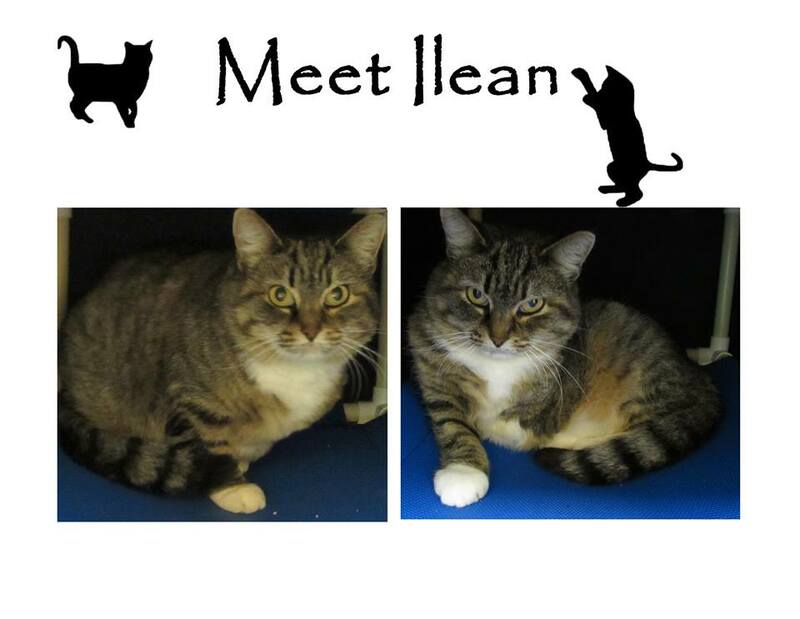 Hello, my name is Ilean. I arrived at AFA as a stray with a badly crippled leg. The kind vets at AFA determined my front leg was beyond saving. My surgery was a success and I am now mobile and pain free. I have recovered nicely and can be found in the “AFA’s Cattery” where I love hanging out in my new “kitty condo”! 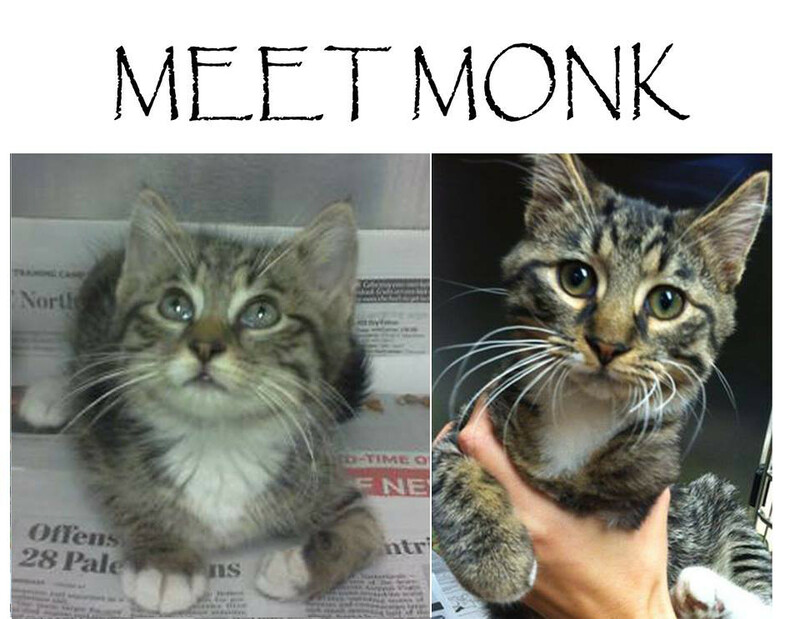 Please come and visit me, I am awaiting a forever home. Thank you to the great staff at AFA, Lauren’s Wing and all the special people who support Lauren’s Wing – The Fund for Animal Care. 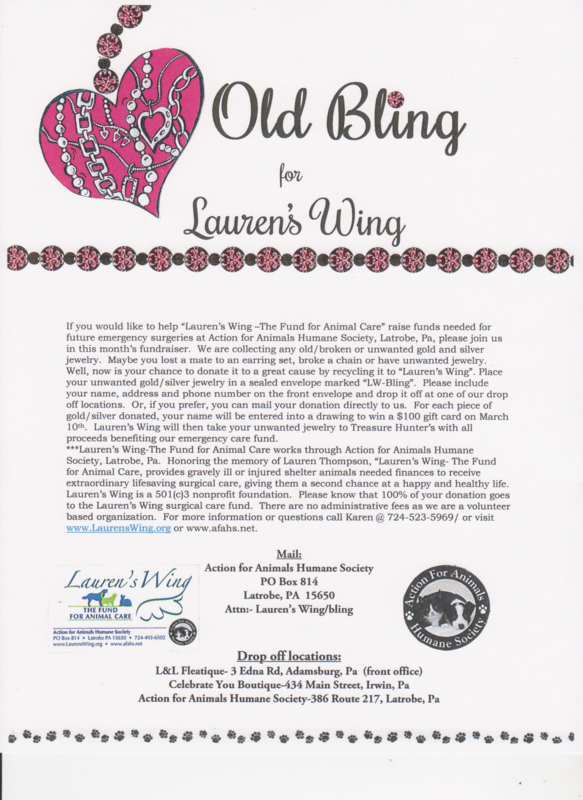 A heartfelt thank you to the Second Chance Fund / The Community Foundation of Westmoreland County for the generous grant of $500 to Lauren’s Wing – The Fund for Animal Care. Honoring the memory of Fred and Kimberly Cecchini, the Second Chance Fund celebrates the gift of life and has donated to non-profits including; The American Heart Association, Core, The National Kidney Foundation, The National Liver Foundation and the Children’s Institute. Lauren’s Wing is truly honored to be a recipient of this grant. Thank you to all who purchased Basket Tickets For Saturday’s Raffle. The raffle raised a total of $1,265 with all proceeds going to Lauren’s Wing – The Fund for Animal Care. 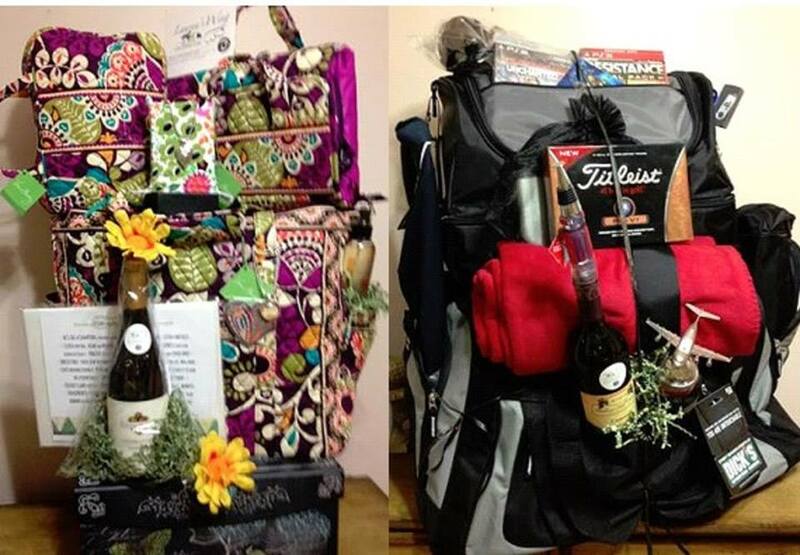 Our lucky winners were: “Her Basket” Jackie Short and the “His Basket” Reno Vitale. Congratulations!!! Special thanks and a shout out to local Latrobe businesses that helped support us: Carpenter Latrobe Specialty Metals, Black and Gold Grille, Glengarry Golf Course, Billy’s Pizza Shack, Chestnut Ridge Foam and Belongings at Monroeville Mall. We are ready for this Saturday’s Action for Animals cash bash at Huber Hall, Latrobe. 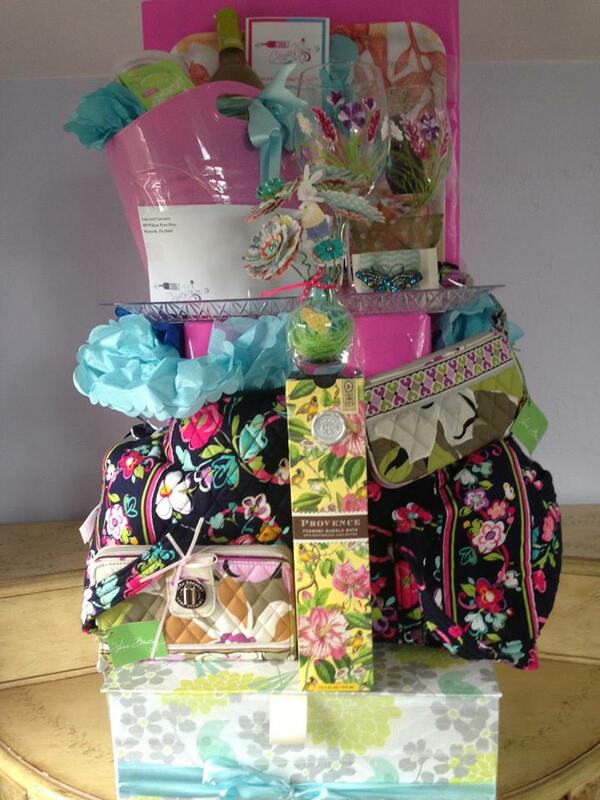 We are raffling one of our Vera Bradley Baskets for the ladies with all proceeds benefiting Lauren’s Wing- The Fund for Animal Care. The gentlemen have been feeling left out the last few raffles, so we have made a special basket for the guys as well this year! Raffle will take place Saturday, Oct 4th- winner need not be present. We will be in the Action for Animals lobby this Friday from 2-4 if you wish to purchase tickets but are not attending the cash bash. Tickets are 3 for $5 or 12 for $10. Additional information can be obtained by calling 724-493-6502 or emailing information@LaurensWing.org. Don’t miss out on an exciting chance to win a basket loaded with goodies and help support the Lauren’s Wing Fund for Medical Care! Greetings from me, “Monk”! 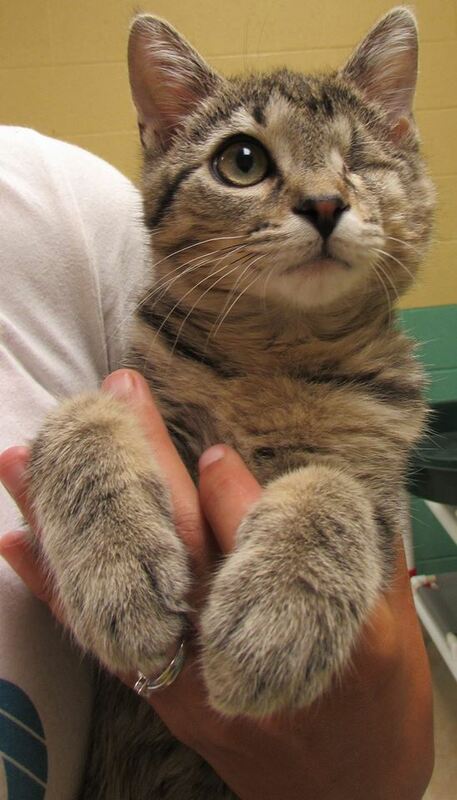 I am a 12 week old male kitty who arrived at Action for Animals as a stray. A birth defect had left me with a deformed front leg which hindered my abilities. After careful consideration, the vets at AFA thought it was in my best interest to amputate the leg. I have adjusted wonderfully and am now waiting for a forever home. You may have seen me hanging out recently at the Lauren’s Wing Table at the “Walk for the Animals” day. It was said that I entertained all who came to visit me for I am quite outgoing and not the least bit shy! Post by Lauren’s Wing The Fund for Animal Care. More about me – Phillip. You may have seen me in recovery mode, but I am now feeling much better and full of energy. 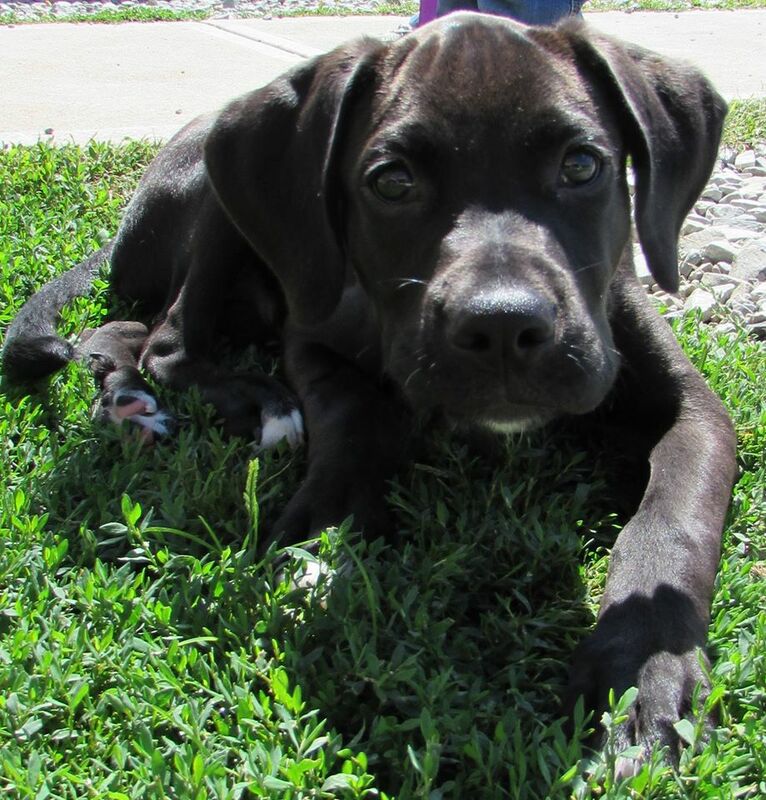 I am a 13 week old Great Dane/Lab mix. My siblings and I arrived at AFA and it was evident I needed attention on my injured back leg. I traveled to Ohio State University where it was determined that I had been “hit from behind’ with blunt force probably when I was 5 weeks old. For 8 weeks, calcium deposits had grown near my injury and muscles had atrophied. So, surgery was done to reduce my femoral head bone and straighten out the pelvis. Success rate for my surgery is extremely high and once I am done growing, the only issue I may have is “losing a bit of my swagger”. I promise, my personality will make up for it! I am happy, outgoing, and a little guy who loves life! My surgery was expensive, but worth every penny. I am grateful to Lauren’s Wing for providing the funds needed to heal my body and spirit and the fantastic staff at Action for Animals for all the tender loving care I have received while recuperating. 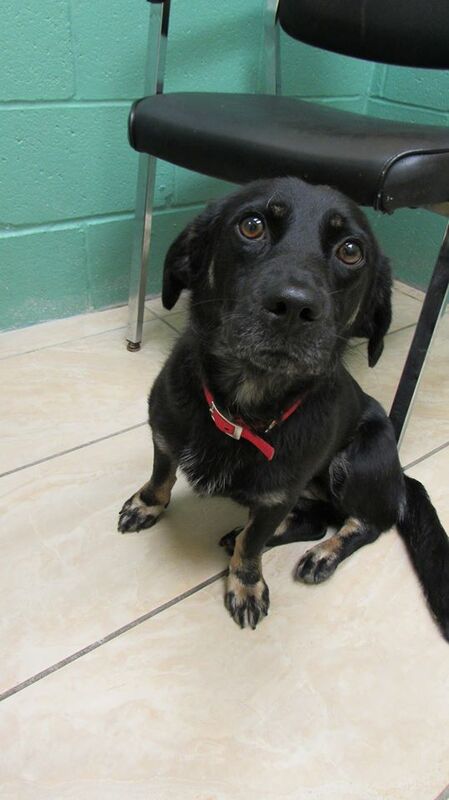 Fantastic news to share – Skylar has been adopted!!! Best wishes to the wonderful couple that have opened their hearts and home to her!!! The Janessa Fleming Memorial Fund (https://www.facebook.com/janessaflemingfund) has presented Lauren’s Wing -The Fund for Animal Care with a $1000 grant. Lauren’s Wing is honored to accept this generous grant and wish to thank Paula Fleming and the Fleming Family for their support and encouragement. 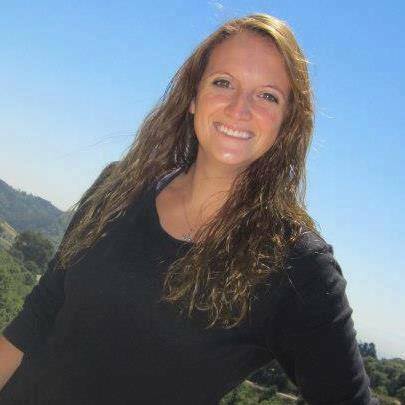 We are blessed to have known Janessa, a beautiful vibrant young woman whose kind heart and loving spirit now lives on through her foundation. Thank you JJ – we love you and miss you. Hello everyone! My name is Phillip and I have just received surgery at Ohio State University thanks to Lauren’s Wing- The Fund for Animal Care. Here I am in recovery looking a little bit tired, but I’m sure with all the great care here and at AFA, I’ll be back to my energetic self soon. Look for updates on me in the near future…………….there is more to come! Lauren’s Wing is delighted to have funded this special puppy’s surgery to repair multiple breaks in his hind leg. Thank you to everyone who supports our fund in making this possible. Greetings! My name is Skylar. I started my summer in a most traumatic way after being hit by a car. Injured, I crawled under a picnic table in my front yard where I sat neglected and injured for three long days. A kind neighbor reported my situation and I was removed from my home. Lucky for me a guardian angel named Lu, (the shelter manager at AFA), came to my rescue. After the AFA vets examined me, they thought it best I travel to Ohio State University where extensive MRIs were done to see if my hip and legs could be repaired. Lucky for me, I didn’t need extra surgery, just plenty of rest and tender loving care. The great staff at AFA provided plenty of tlc and now I am happy to report, I have sufficiently recovered enough to begin the search for my forever home. In spite of my hardships, I am sweet, gentle and just love attention. Come visit me and see for yourself! Thank you to Lauren’s Wing for paying for all my medical care while at OSU. Hugs and kisses to all my new friends who have supported Lauren’s Wing. The Sky is the limit now for me because of your kindness! Today we’re proud to announce the latest two recipients of care from Lauren’s Wing! All one has to do is look in her very sad eyes to see that Nyla has had one tough life so far. 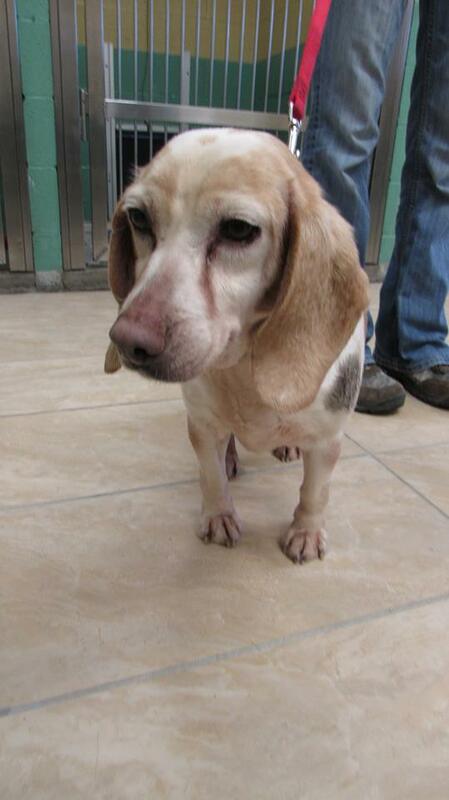 This poor mama beagle arrived afrom an open door shelter with a huge belly and AFA staff was uncertain if it was a mass or if she was pregnant. The new blood machine at AFA indicated it was indeed a mass and exploratory surgery was needed. Fortunately, the mass was not life threatening. Nyla also had dental work completed and a tooth removal. In spite of not feeling so well, Nyla has exhibited such gentleness. She is such a sweetie and is anxiously awaiting to start a new and happier chapter in her life where hugs, kisses and love will replace the years of neglect! Lauren’s Wing is pleased to have provided AFA the necessary funds for Nyla’s surgery. Nyla is ready and waiting for her “forever Home”. Schmucker arrived at Action for Animals one busy weekend in late April. Look closely at his eyes – he recently had surgery at AFA to open them! He saw for the very first time after his surgery. Schmucker had a condition called entropion where the eyelids roll back on the eye. Entropion can cause severe irritation and injury to the eye. Left untreated this condition damages the cornea and results in loss of vision. Fortunately for 10 month old Schmucker, his condition was treated in time. When he first opened his eyes and saw for the first time, his paw went out reaching for the staff. 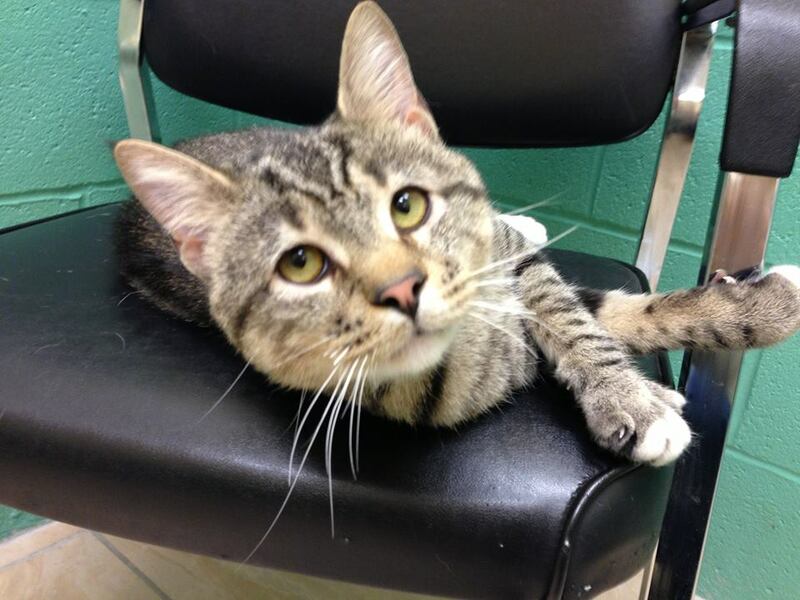 Schmucker is an adorable, curious, super friendly kitty who would make an excellent companion. Lauren’s Wing is delighted to have provided the funding to make his surgery possible! Raymond, Willow and Riviera have all been adopted into their forever homes! Lauren’s Wing-The Fund for Animal Care is honored to partner with AFA in helping our animal friends find happy new beginnings! Congratulations to the Lauren’s Wing Spring Raffle Basket Winner Karen Quenzler. Thanks to everyone for your generous support of our cause to help shelter animals in need of medical care. A very special thanks to Corks and Canvases and Artist Sarah Hunter who helped make this possible. The Showers of Cash Bash will be held April 5th at Huber Hall in Latrobe. AFA, working together with Lloydsville VFD! Meet Darley – our newest recipient of the Lauren’s Wing – Fund for Animal Care. 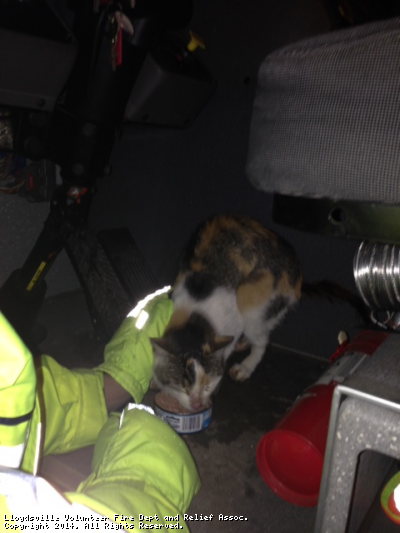 Lloydsville VFD was activated for a cat stuck in a storm drain. After two hours, they were able to rescue the cat named Darley. AFA took Darley, cleaned her and provided necessary medical care. 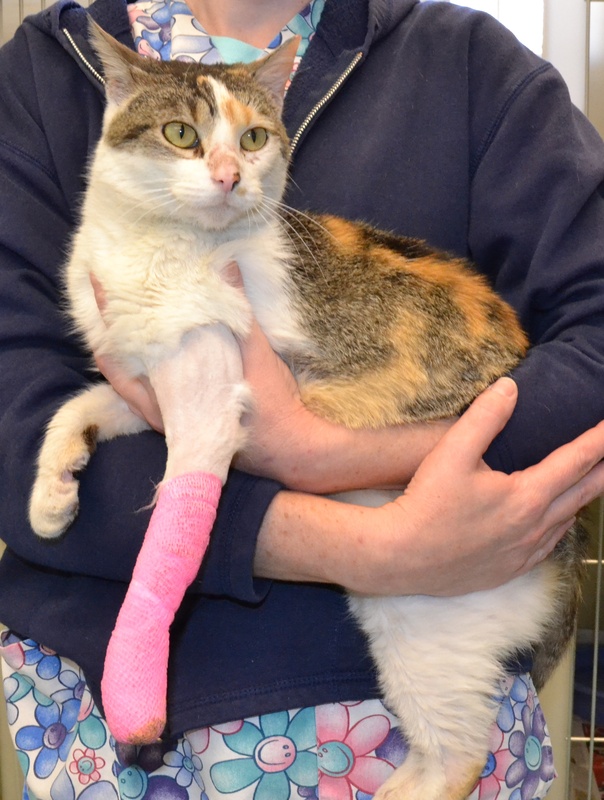 She had a severe cut across her left front paw that needed surgery that resulted in the loss of two toes. Darley also had a BB pellet removed from her side. She was starving upon arrival at AFA, but we are happy to report that her condition is improving as she recovers from her trauma. Kudos to the Lloydsville VFD, and the AFA’s vets, staff and volunteers for making this rescue possible. And thank you to all who support AFA and Lauren’s Wing so we can continue our work of helping animals in need. Darley will soon be ready to find a forever home! Top picture: Darley with the Lloydsville VFD. Bottom picture: Darley post surgery at AFA. Meet Riviera – our newest recipient of the Lauren’s Wing – Fund for Animal Care. Riviera was found dragging herself into a yard on River Street in Latrobe. The couple who found her immediately knew something was wrong and brought her to AFA. She was promptly given medical treatment and it was discovered that there were two breaks in her left hind leg. Sadly, her leg had to be amputated. She is doing well and hopefully after her recovery will find a great new home of her own with her old life on the streets behind her. Thanks to AFA and Lauren’s Wing for giving Riviera a second chance for a forever home! The winner of the one hundred dollar visa card drawing is Amy Zimmerman of Ligonier. Congrats Amy! A total of eight hundred eighty dollars was raised for “The Fund For Animal Care”. Raymond shortly after his surgery, ready to play! Meet Raymond – our newest recipient of the Lauren’s Wing – Fund for Animal Care. 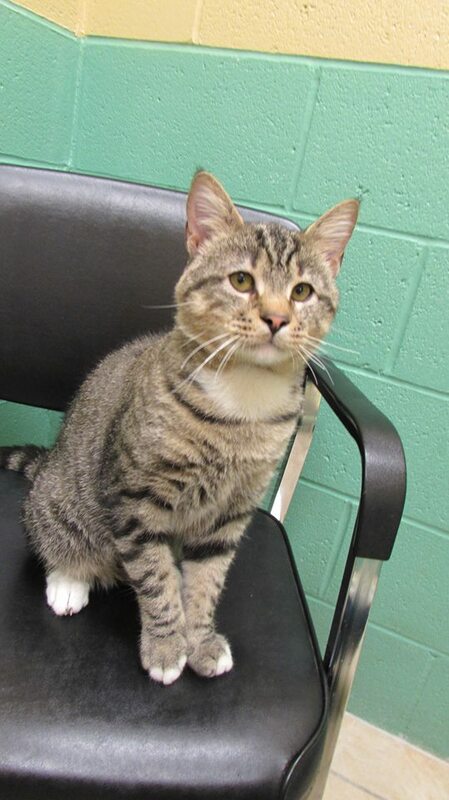 “Raymond was scheduled to be euthanized at an open door shelter. The AFA shelter manager saw him sitting in a pen while picking up other animals on a transfer. She asked if she could take him so AFA could try to help. He had been an owner surrender in need of medical care and as a mature gentleman, his options were few at his previous shelter. Raymond arrived at AFA and was evaluated. He had terrible teeth and a large lump under his eye. After dental surgery to remove several bad teeth, two fistulas were discovered in his mouth. AFA vets, Dr. Mucci and Dr. Bowser felt that perhaps the open fistulas were clogging his tear ducts, resulting in the mass under his eye. Raymond required additional specialty surgery to close up the fistulas. Hopefully, this poor little guy will have relief soon! Raymond is a trooper. In spite of how terrible he must feel he is gentle and sweet. He is a handsome guy and is so deserving of this second chance. Imagine how afraid he must have been when dropped off and left at the shelter in need of medical attention. Please check back with us as we will be posting some new pics of Raymond after he has a little time to heal! “Willow arrived at AFA in late December 2013. AFA received a call and plea for help from an overcrowded open door shelter. Seventeen dogs made their way to AFA that night through a transport effort of shelters working together. As the van pulled up, our shelter manager opened the back door and there in the middle of the stacks of pens sat Willow. Her leg was bandaged and she had wounds over the top of her head and down her side (old wounds but is was evident she needed additional medical care). The girls on the transport said she was a stray and had been hit by a car and that they did the best they could. So Willow came to us or maybe was sent to us by an angel. She was examined by Dr Mucci who felt we should seek a second opinion from a specialist as to whether we could save her leg or if an amputation would be needed. While Willow was not in pain, she did not have full use of her leg. After weather delays, Willow finally made it to Ohio State University Veterinary Hospital. Willow was a good candidate for surgery and the staff at OSU felt her leg could be saved. 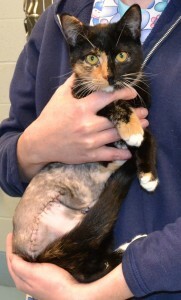 Willow had her surgery and spent several days recovering at OSU. AFA picked her up on Feb 17, and so far, Willow is doing wonderful! In 6-8 weeks, Willow will make her journey back to OSU for a re-check and to determine whether or not the plates and screws in her leg can be removed (allowing for better movement). In the meantime, she is a happy, healthy and walking on all fours! Note from Lauren’s Wing: It was a joy to see Willow post surgery. 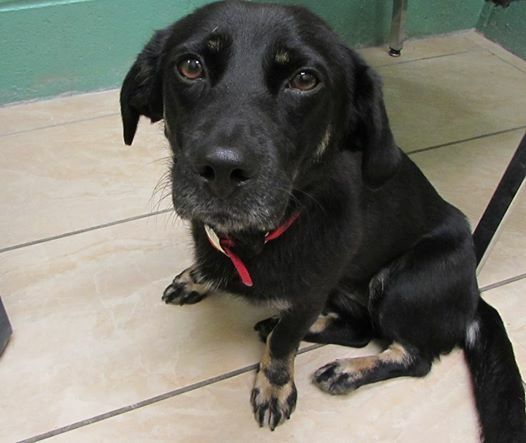 She is a sweet, loving, happy go lucky girl who shows no sign of her previous life’s hardships and traumas. 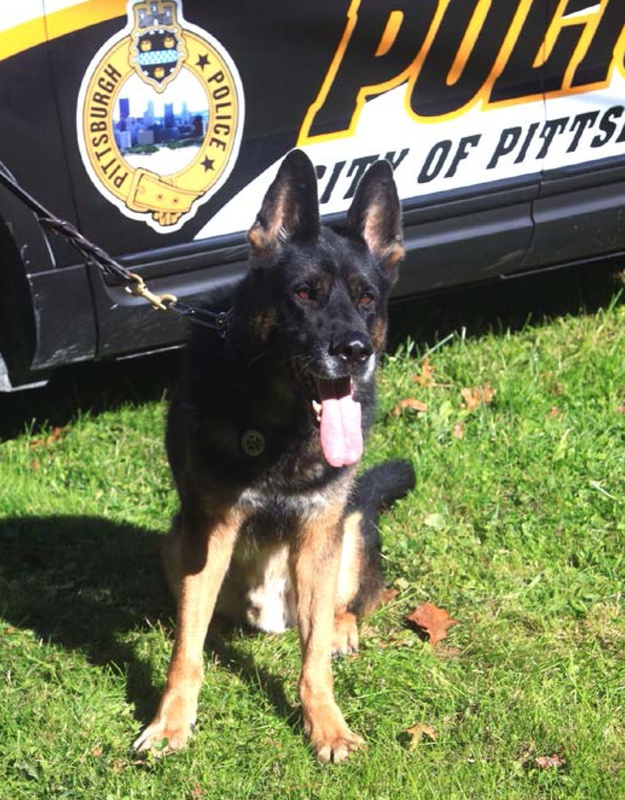 Lauren’s Wing is most grateful to accept a donation in honor of Rocco, the heroic K9 Officer who gave his life serving the Pittsburgh Police force. Very sad news to report ….. Cornelius was not healing properly and he had to go back in to surgery today for evaluation. Dr. Mucci found a tumor growing around his retinal nerve and immediately had the cells analyzed. It ‘s been a long, hard journey for Cornelius but life is now much better. He was a “town cat” going from home to home to get a handout, and had a routine. First house for breakfast, another for lunch and last one for supper. He had nice little old ladies who cared for him. Being the town cat, he needed to have street smarts. One day last week, while crossing the street, he was not so smart, and was hit by a car. He didn’t make his rounds for his meals and his ladies got worried. 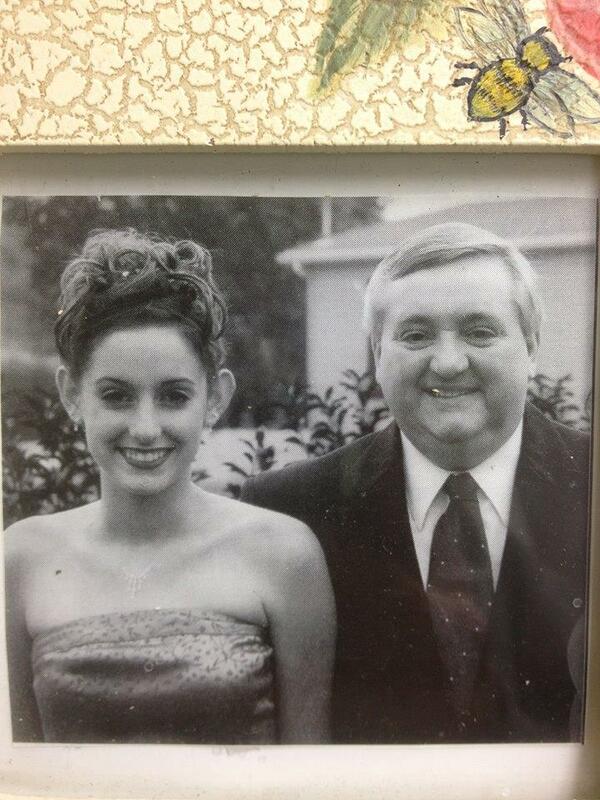 He finally made it to one of his “homes” early in the morning, three or four days after the car accident. Immediately, the woman knew something bad had happened. She scooped him up and put him in a box. Cornelius was warm, had a full belly and felt safe. However, his caretaker cried as she could not keep him and knew his medical bills would be high. She called the shelter and Dr. Mucci was there to help him. 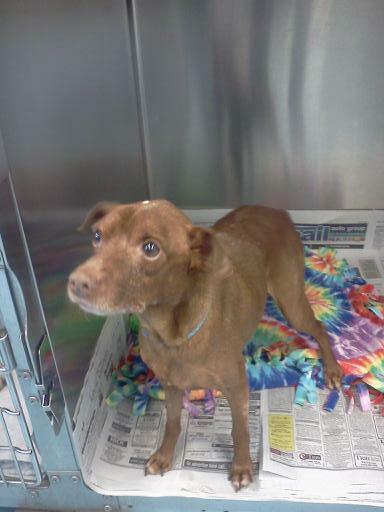 Our shelter manager Lu said to bring him right in and he arrived in a blanket at AFA. 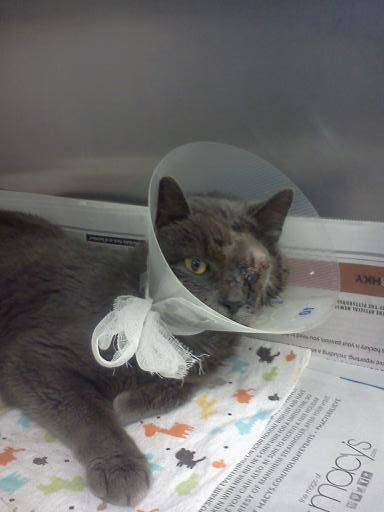 Dr. Mucci and staff vetted Cornelius and he underwent surgery. 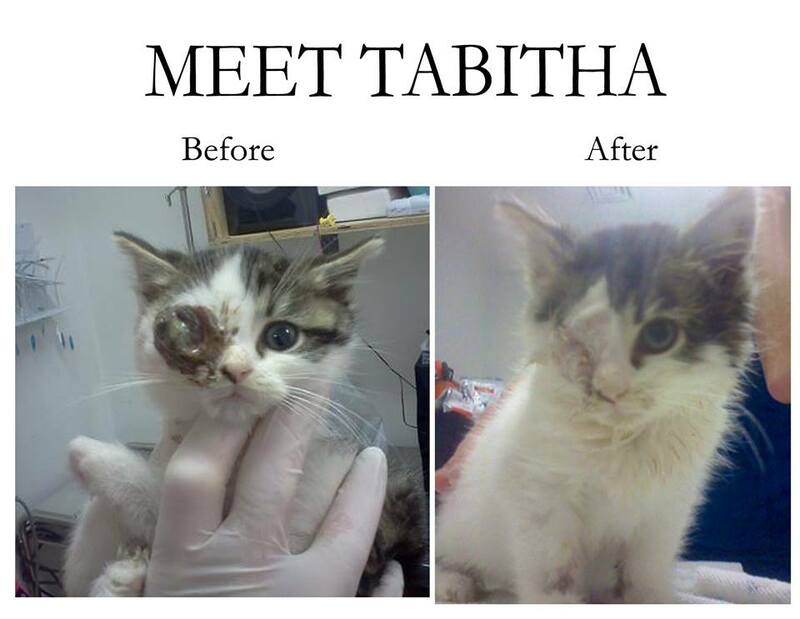 By the end of the day, his eye was removed but boy does he feel better now! Cornelius will probably miss his old life and his ladies but we are sure, once healed, he will embrace a new family with open paws! Thank you to Lauren’s Wing, the Fund for Animal Care (www.laurenswing.org) for providing the funds needed for his medical care and surgery. Many thanks to Jessica Rafferty and the Quatrini Rafferty Law Firm for featuring an article on Lauren’s wing in the Winter 2013 Legal Update. Your assistance in helping us spread the word about our mission is greatly appreciated! Great news! Chives has been adopted and gone to her “forever home”! We wish her years of happiness! Also, Melvin is now recovered and awaiting a forever home of his very own!